Frank Christopher Busch is a member of the Nisichawayasihk Cree Nation and grew up in northern Manitoba. 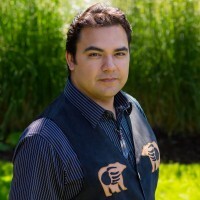 He has spent his professional life working with First Nations businesses, non-profits and governments at the band, regional tribal council, provincial, national and international levels. He lives in Westbank First Nation, British Columbia.